This accurately describes the set of skills that an employer is after when they seek to hire a single data scientist. However, such people are rare. They have been compared to unicorns. 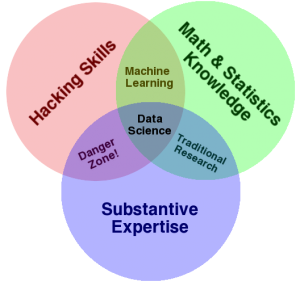 To depict data science as an intersection of these skills presents a misleading picture of our ‘profession’. In reality, the term ‘data science’ covers work that is done by many existing professions. Evan Stubbs emphasised these points last week in his talk, Big Data, Big Mistake. According to him, the relentless search by employers for ‘unicorn’ data scientists has led to disappointment and disillusionment, and we need to communicate to them the idea that data science is groups of people. With ‘data science’ now a mainstream term, we have a fantastic opportunity to unite our professions under a common banner and combine our skills together to solve problems we cannot do alone. This is not only good for all of us as practitioners. It is also what society seeks from us. Let us embrace data science as an inclusive discipline. Drew Conway’s Venn diagram is licensed under a Creative Commons Attribution-NonCommercial Licence and is reproduced here in its original form. 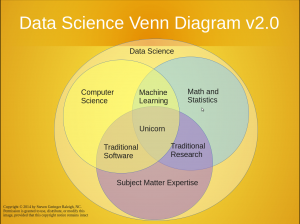 The Data Science Venn Diagram v2.0 is an adaptation of Drew Conway’s diagram by Steven Geringer and is reproduced here by permission. The image of both diagrams link back to the original source.